If you run the line out of the transistor Guild into the preamp in, does it get both loud and awful at the same time? You mean the model 4 amp? I did that with the Micro Cube yesterday to test that the power amp section was working. I'm afraid to try it with the little Guild because it might sound good and invalidate my inebriated ranting. BTW I was making myself a cocktail because I need a break from thinking and my wife asked if I was going to work on the amp some ore. I replied that no, amps are like handguns: you don't work on them when alcohol is involved. The adderol must have worn off. I might have to punt this one to an expert. Neither schematic looks right to me. This amp has two 12AX7s and to me it looks like both triodes are in use on both of them which is not reflected on either schematic. I can trace a schematic and I've got all great tools, but as I've said before, I'm no EE, and I think I've gotten to the limit of my knowledge and abilities when it comes to amps. What's killing me is that there's nothing visually wrong, and the amp worked great before I cleaned it. The only thing that happened was the volume seized, and that moves freely now, but what I'm seeing isn't reflected in either schematic so I don't know if it's right. Also the tone switch just hurts my head no matter which schematic I look at. Default, you want a whack at it? I know you're crazy busy but I'm happy to drive it at least close to you. 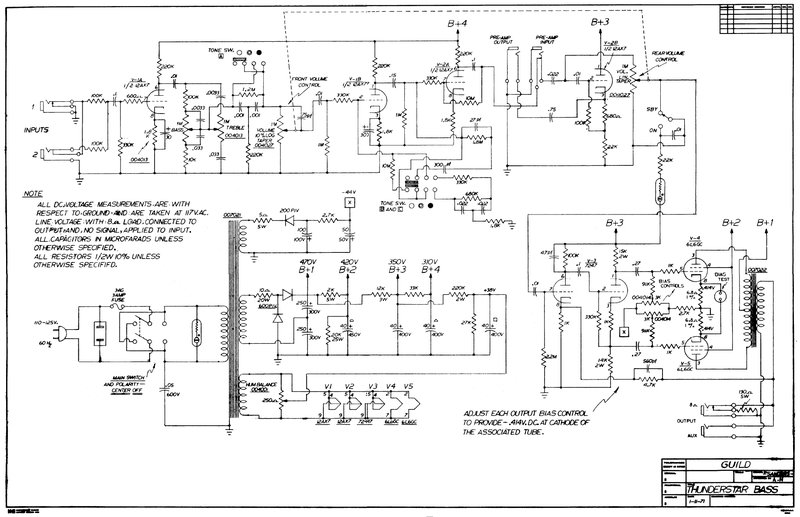 That 7-29-69 schematics in post #46 is not for the amp you got. That is only a 4 tube amp but you got a 5 tube one. The 1-11-71 one looks like what you have (the volume pot in your amp is dated 7032), it shows both the front and rear volume pots and it shows both 12AX7s for V1A and V1B and also as V2A and V2B! V3 is the 7247. Seems all to fit as far as I can see. In that schematics the volume pots are both 1M and not 500k/1M as you measure. Maybe that one volume pot is still screwed up in your amp. Last edited by SFIV1967; 03-22-2019 at 01:24 AM. Sure, things are lightening up at work for a couple of months. I'll lend you a review amp, if you'd like. The 1-11-71 one looks like what you have, it shows both the front and rear volume pots and it shows both 12AX7s for V1A and V1B and also as V2A and V2B. V3 is the 7247. Seems all to fit as far as I can see. GAAHH!!!! That's SO much better - thank you! What motivates people to plaster their own watermark over information that they don't own? That's infuriating. Here, I fixed it so I can actually use it. Nice. Now that I have what appears to be a correct schematic I'll take another shot at it, but after tomorrow I have a book to edit so I'll need to take a step back, though a review amp might be a nice distraction from that! I saw that. That means I'll definitely never find one of those as a replacement. I did find a video showing how to make your own by cannibalizing two dual pots, so that's useful. Mu gut tells me that it's gotta be that pot because I hadn't touched anything else and that had given me trouble.